Far in the south of Rokugan sits the Kaiu Wall, a hulking shield that defends the Emerald Empire from the horrors of the Shadowlands. Manning this wall is the stalwart Crab Clan, guardians of the Rokugan who sacrifice everything in the name of duty. 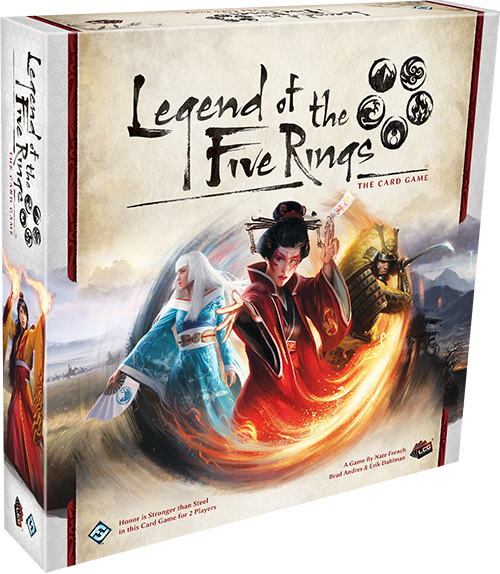 Today, we’re previewing the Crab Clan in Legend of the Five Rings: The Card Game. The Crab Clan act as an impenetrable curtain, excelling when defending their provinces and taking calculated losses to gain major advantages. The Crab excel in defending their provinces, repelling their foes with an unwavering force unlike any other in Rokugan. 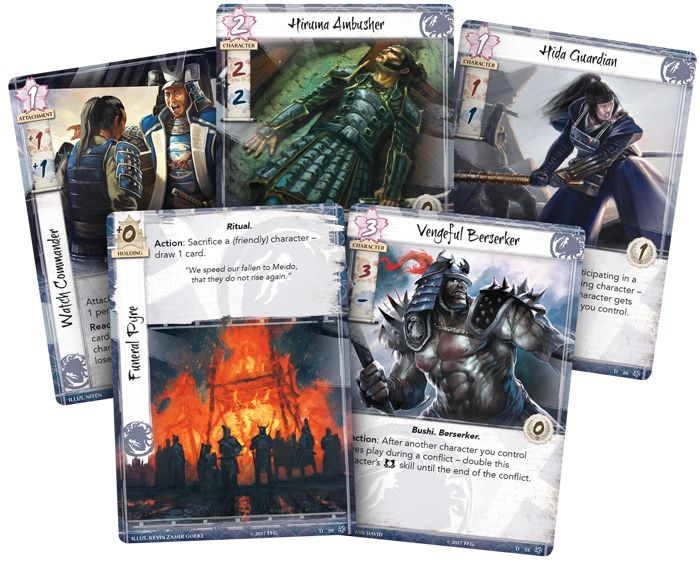 The Hiruma Yōjimbō (Core Set, 28) is one of the most powerful 2-cost characters in Legend of the Five Rings: The Card Game with four military skill and three political skill. 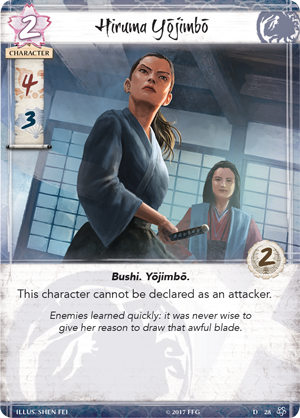 With the drawback of not being able to attack, the Yōjimbō is only able to contribute her impressive skills to defend the Crab provinces, which for the Crab is often of superior importance. 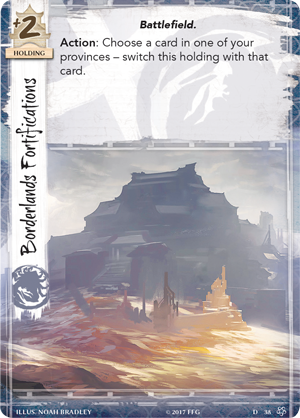 The Crab’s defense is further bolstered by Borderlands Fortifications (Core Set, 38), a holding that provides an additional two province strength to whatever province it's in. Borderlands Fortifications can also be moved to your other non-stronghold provinces as an action to provide support wherever it is needed. 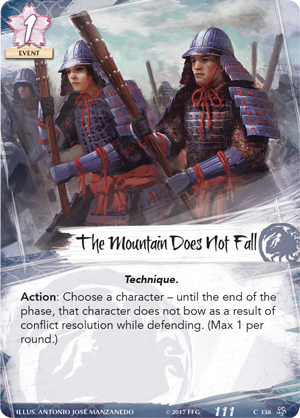 The Mountain Does Not Fall (Core Set, 138) allows a character to not bow during a conflict resolution in which they are defending. This not only allows them to remain unbowed to defend again, but provides them the opportunity to counter-attack when it is your turn to declare a conflict. The Hiruma Ambusher ( Core Set, 130) can take your opponent by surprise as a conflict card, and when he’s added to a conflict as a defender, he can ensure the Crab maintain their advantage by restricting a character’s triggered abilities during the conflict. 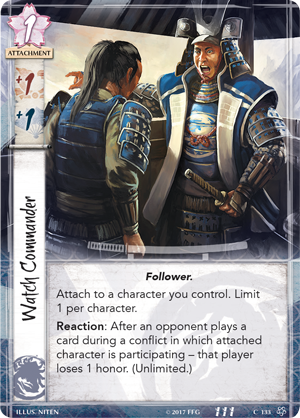 You can also penalize your opponent for playing conflict cards during conflicts with Watch Commander (Core Set, 133), which not only provides a buff to military and political skill, but also forces your opponent to lose an honor after they a play a conflict card in a conflict with the attached character. Importantly, this ability can be used an unlimited number of times in a round, giving your opponent the difficult decision of playing conflict cards or maintaining their honor. Defending the Kaiu Wall is the Crab’s sacred duty, and the clan will give everything they have to ensure that it does not fall. The Way of the Crab (Core Set, 137) embodies this by allowing you to sacrifice a character to force your opponent to sacrifice a character. 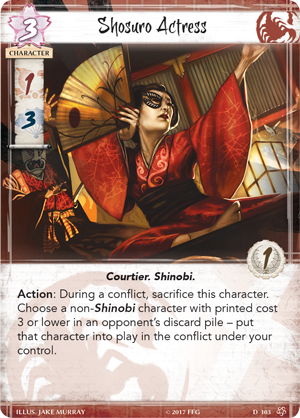 While Way of the Crab does not let you pick the character your opponent sacrifices, Hida Tomonatsu (Core Set, 34) provides more targeted removal. Whenever she wins a conflict as a defender, you may sacrifice her to move a non-unique attacking character to the top of their respective deck. This can nullify a character with plenty of fate or a powerful ability. The Steadfast Witch Hunter (Core Set, 35), when used at the right time, can also change the momentum of a round. The Witch Hunter can sacrifice any friendly character to ready another. This can provide huge momentum swings, as sacrificing a bowed character to ready another can provide you the forces you need to break a province after defending your own provinces with multiple characters. The Crab also have cards that synergize well with sacrifices. 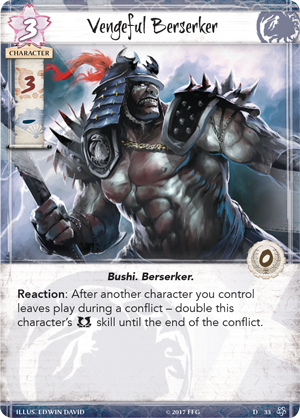 Whenever a character you control leaves play during a conflict, Vengeful Berserker's (Core Set, 33) military skill doubles until the end of the conflict. This allows you to receive the boons granted by the sacrifice effects while also boosting the Berserker’s military skill, providing a strong threat during conflicts. The Kaiu Wall must not fall. This idea is ingrained in the head of every Crab from birth, and both their unique province and stronghold exemplify this ideal. 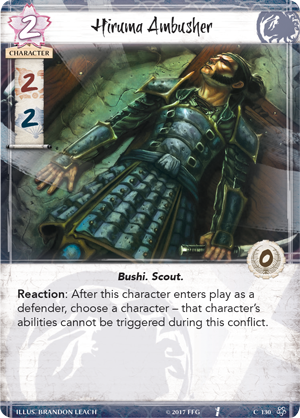 Shiro Nishiyama (Core Set, 1) can be bowed to provide a boost to both military and political skill to each defending character you control during a conflict. 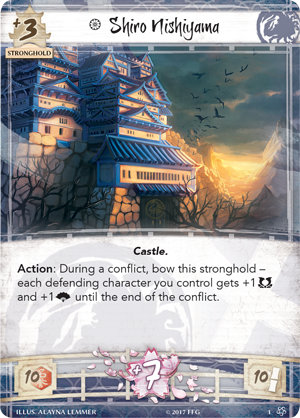 The mere threat of Shiro Nishiyama can impact your opponent’s decisions, as they always have to make sure they account for the potential boost this stronghold can consistently provide. The more characters you send to defend your provinces, the stronger Shiro Nishiyama becomes. With a starting honor value of ten, The Crab begin the game with a smaller amount of honor than many other clans, but it is a small sacrifice in the name of duty. This skill boost can be used when defending The Crab Clan’s unique province, Defend the Wall (Core Set, 8), which allows the crab to trigger the contested ring when they win a conflict at the province. Normally, triggering the effect of a ring only occurs when you win a conflict as the attacker, Defend the Wall allows the crab to be rewarded for their defensive efforts. 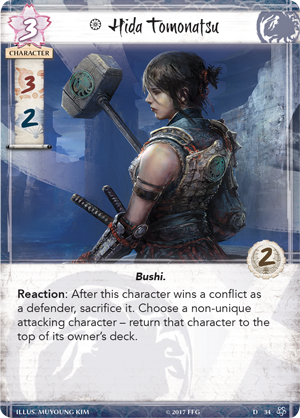 Of all the Clan Champions, few have the sheer presence of the Crab Clan Champion Hida Kisada (Core Set, 37). The Great Bear has spent years guarding the wall, and has sacrificed personal glory in pursuit of his singular mission. Hida Kisada plays off the Crab’s ability to come out ahead in conflicts. As long as you have not lost a conflict in the phase, you may cancel the effects of the first action ability your opponent uses during a conflict. 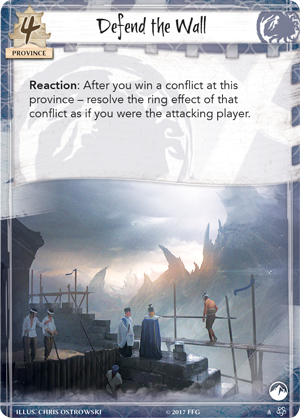 While the Crab defend their lands, your opponent will have to work much harder to influence conflicts, having to waste an ability before being able to use most effects. Hida Kisada is exemplary in his consistency. At zero glory, honoring Hida Kisada will not boost his stats, but dishonoring him will also not affect Kisada’s ability to utterly dominate military conflicts with seven military strength. 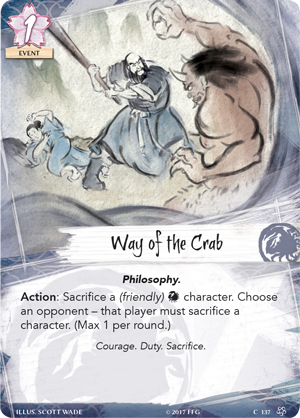 Duty-bound and stoic, the Crab are one of the more militant forces in Legend of the Five Rings: The Card Game. 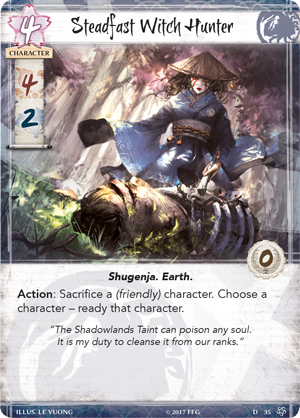 Join us this Friday, July 14th, at 11 a.m. CST on the Fantasy Flight Games Facebook Page for another episode of L5R Live, where we will be giving a live gameplay demonstration! Be sure to visit the Facebook page right now to vote on which two clans will be featured. 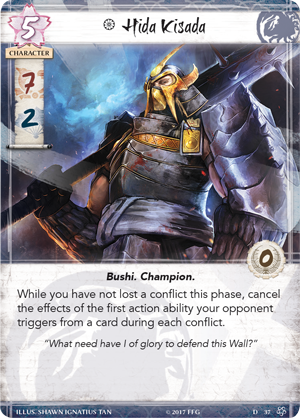 Defend the wall and purchase Legend of the Five Rings: The Card Game (L5C01) at Gen Con 2017 or from your local retailer in the fourth quarter of 2017!